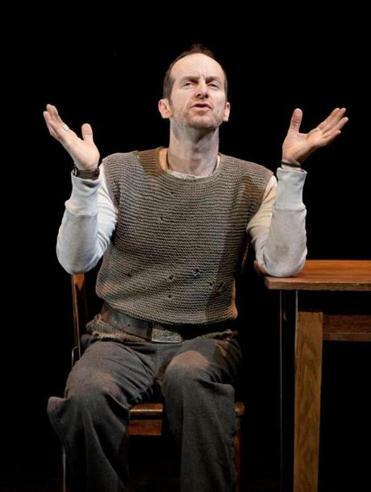 NEW YORK — When actor Denis O’Hare and director Lisa Peterson began developing their theatrical adaptation of Homer’s “The Iliad” in 2005, the United States was embroiled in two simultaneous wars halfway around the world. Yet the duo never intended their update of Homer’s ancient epic poem, about the brutality of the Trojan War, to be an antiwar jeremiad. Indeed, the collaborators came to the project, “An Iliad,” with differing passions and perspectives about the seemingly insatiable human thirst for violence and destruction. Recommended performances around the area. O’Hare is well known for his Tony Award-winning role as the nebbishy accountant who falls in love with baseball in Richard Greenberg’s “Take Me Out,” and for playing the foppish lunatic vampire Russell Edgington on HBO’s “True Blood.” In last year’s Obie Award-winning New York Theatre Workshop production of “An Iliad,” O’Hare alternated performances with actor Stephen Spinella. “An Iliad,” culled from a touchstone contemporary translation by Robert Fagles, pares back the sweeping story to focus on the battle between rageful, grief-stricken warrior Achilles and prideful Trojan hero Hector, who slays Achilles’s companion, Patroclus. But the 100-minute play, which features a score performed by an onstage bassist, also incorporates the smack-talking showdown between the Greek king Agamemnon and the recalcitrant warrior Achilles; the tragic death of Patroclus, who volunteers to take Achilles’s place in battle and loses his life; and the elderly Priam’s journey across smoldering battlefields to plead with Achilles for his son Hector’s rotting corpse, in order to to give him a proper funeral. Hector’s devoted wife, Andromache, and Helen, the woman whose capture sparked the war, also make appearances. As Homer does, Peterson and O’Hare use metaphor to convey the emotions and mindsets of these jealous, prideful warriors and hubristic leaders. To help us identify with the rival Greeks and Trojans, who battled to a stalemate during nine years of fruitless fighting, they invoke a prosaic scenario: the stubborn refusal to switch to a faster-moving supermarket checkout line after you’ve been waiting patiently in another line for 20 minutes. The frustration of changing course is too much to bear. As a starting point in creating the piece, Peterson and O’Hare videotaped themselves improvising key sections of Fagles’s “Iliad” translation, putting the action into their own words. 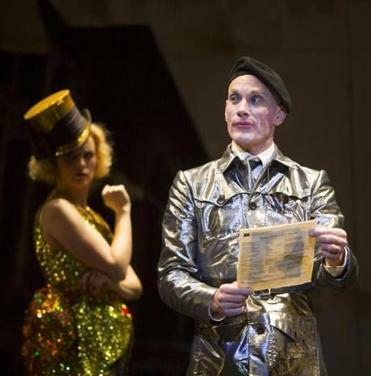 Other times, Peterson would interview O’Hare as the narrator and ask him questions about different characters in the play. They transcribed those sessions and then rewrote and edited the material. More than anything, O’Hare says, “An Iliad” raises hard-to-reconcile questions about human nature and the human experience. 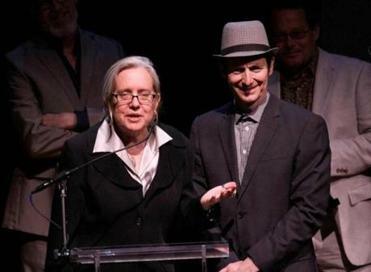 Director Lisa Peterson and actor Denis O’Hare accepting a 2012 Lucille Lortel Award for outstanding solo show for their off-Broadway production of “An Iliad,” a piece they also wrote. As O’Hare sees it, we don’t have to look any farther than our own personal and professional lives to understand these larger-scale conflicts. There is, Peterson says, a somberness at the heart of Homer’s swaggering yet mournful epic, which understands the destruction and loss war inflicts on civilizations. Christopher Wallenberg can be reached at chriswallenberg@gmail.com.